There are amazing things going on under water: at night the sea mysteriously sparkles, the tiniest of organisms (plankton) have the greatest power, and the fish are by no means taciturn but instead communicate loudly with one another. 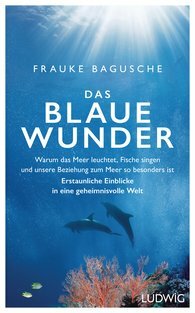 Marine biologist Frauke Bagusche has some fascinating tales to tell – stories of the smallest and the largest living creatures in the world. She explains where the smell comes from that tickles our nostrils while we are walking along the beach; what causes the sparkle we see in the water at night; and why the sea steers not only our emotions but also our destiny and that of the entire planet. Her account, in which she explores her own intimate relationship with the sea, is based both on the results of the latest scientific research and her personal experience. Because no matter where we are, we are bound to the blue miracle with every breath we take.